Watermelon - Whenever I think of watermelon, I remember the roadside shop selling them near my house during Summer (Of course in India!). 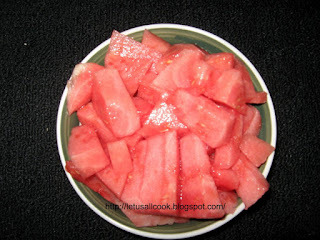 Every day when we come back from school we used to get 1 watermelon piece and eat them all the way home. Huh...lovely days! Sweet memories! Watermelon, consumed in any form is tasty and healthy. We have watermelons with seeds and seedless. Undoubtedly I love the seedless. You know, seedless is less work. A one-cup serving of watermelon will provide around 48 Calories. Watermelon is an excellent source of vitamin C and vitamin A, with one serving containing 14.59 mg of vitamin C and 556.32 IU of vitamin A. Watermelon also provides significant amounts of vitamin B6 and vitamin B1, as well as the minerals potassium and magnesium. Pink watermelon is also a source of the potent carotenoid antioxidant, lycopene. The amino acid citrulline was first extracted from watermelon and analysed. Watermelons contain a significant amount of citrulline and after consumption of several kg an elevated concentration is measured in the blood plasma, this could be mistaken for citrullinaemia or other urea cycle disorder. wow! a lot of technical terms. Let me put it more simple. Now coming to our milkshake. If you ask me to choose between milkshake and fruit juice, I will choose milkshake. But if it is with milkshake and ice cream, then the winner is ice cream. OK! Enough of my milkshake and ice cream story. Now for the preparation of watermelon milkshake. Cut the watermelon into small pieces. Add them to the blender. Blend it for a minute taking the smoothie option in your blender. Now add the milk and sugar. Again blend it for 2 minutes in smoothie option. The more you blend the more creamy the milkshake will be. Finally add a pinch of salt and serve cold! lovely milk shake! looks so refreshing. I like that little bubble saying try me! Do you mind if I try it? great! I Know Water melon juice, Water melon milk shake new to me. very creative idea. 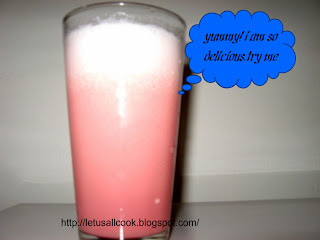 i am reminded of my school days too now..getting back home and having watermelon :) Milkshake with it looks refreshing. Hey, thanks for stopping by my blog, Sangeeth. Watermelon - refreshing & perfect for summer! wow,..looks tasty,..u reminded me ofmy childhood days,..
love watermelon..after looking at the chunks here, i am tempted..i have to get one soon..drink looks very refreshing..
My fav fruit of all, er..probably the best among the fav 3, watermelons! check out my blog for a treat for you! I have never tried this combo before. To tell the truth, I'm a bit skeptical about water melon and milk. But I will definitely give it a try the next time I buy water melon. One thing for sure food blogging is definitely making me a little more open to new things.